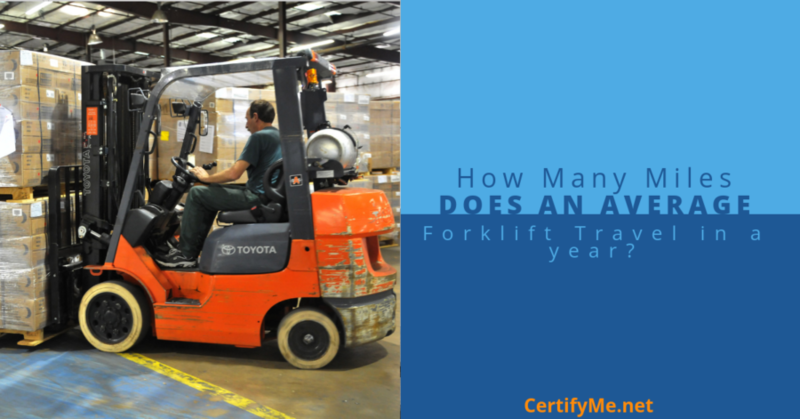 Have you ever wondered how many miles a forklift gets driven in a year? As the workhorse for many warehouses, they’re “on the road” eight hours a day, often more. They may not travel very far with each trip. But over time those small trips can add up to a lot of miles. There’s only one problem with answering this question – forklifts don’t come with mileage indicators. So there’s no way of knowing how many miles they rack up each year. Instead, forklift “age” is measured in hours of use, not miles. And that can be easily tracked. Assuming an 8-hour work day, the average forklift runs 2,000 hours per year. Throw in some overtime hours on a regular basis, and that number will increase. With the average lifespan of a forklift around 10,000 hours, that comes to about five years of reliable service. The best-made forklifts can last as long as 20,000 hours. What Determines the Life Span of a Forklift? As with autos, two forklifts of the same model can age at very different rates. Forklift types and their lifespan are determined by four basic factors. – Type of engine. One of the biggest factors is whether the forklift uses internal combustion (IC) or electricity as its source of power. The electrics have a real advantage in terms of longevity, mainly because they have fewer moving parts. The simpler mechanical setup and alternating current motor reduce the risk of fire. Electrics also tend to need fewer repairs. Their weakness is the batteries. They last for around 1,500 charging cycles, or about five years before they need to be replaced. – Forklift environment. Aside from the type of engine, where the forklift works have the biggest impact of aging. A truck that works indoors in clean conditions will have a much longer life span than one working outside in rough terrain and extreme weather. Consistently heavy loads can also speed up the aging process. If you use forklifts for inside and outside work, it’s a good idea to rotate them every few months. This will slow down the aging process. It will also help your trucks wear out at the same rate. – If you maintain your car on a regular basis, it will last longer. The same is true with forklift maintenance. Keep your trucks clean and well-tuned and they will provide many more hours of use. This means checking fluid levels before each shift. Tires, belts, and other parts that wear out should also be checked for wear-and-tear. Changing the oil and refilling water levels in the battery of an electric truck will also help it last longer. If you wait until a problem occurs to perform forklift maintenance, you can expect performance problems and shorter service life. You can also expect costly repairs and reduced productivity. – Operational hours. On average, well-maintained forklift engines last 10,000 to 20,000 hours. Forklifts that work in extreme conditions will rack up fewer hours before needing replacement. – Daily inspection. This involves checking tires pressure, fluid levels, brake performance and more. A daily inspection makes sure the forklift is safe to use before starting the shift. It helps spot small problems before they become big ones. And they’re required by OSHA. Using a standardized checklist will ensure you don’t overlook any safety elements. – Scheduled maintenance. This involves oil changes, replacing filters and spark plugs and other longer-term maintenance tasks. Always follow the manufacturer’s recommended schedule when performing these tasks. Some recommend service based on time. For example, change the oil every three months. Others schedule maintenance by hours of use. Either way, servicing your forklifts in a timely manner will help keep them safe and make them last longer. It will also save on repairs. – Regular cleaning. Clean your forklifts at least once a week. This does more than keep them looking good. It also improves safety by preventing the buildup of combustible materials on the truck. Cleaning should include blowing out the radiator, wiping down any dirty parts, and changing filters when needed. The easiest way to stay on track is to sign up for a forklift maintenance plan. You pay an annual fee to a company that specializes in forklift maintenance. They service your forklifts as scheduled, using trained technicians. Your maintenance is performed on schedule. It is done right. The fee covers all necessary maintenance, but repairs cost extra. However, keeping your forklifts well maintained will reduce the need for repairs. The company will also provide detailed records so that you know what procedures were done and when. A good program of forklift maintenance does more than just extend the life of your trucks. It improves safety. It reduces downtime and lowers the cost of repairs. If an accident occurs, you can show that it wasn’t due to lack of maintenance. This can help avoid OSHA penalties. Finally, regular forklift maintenance also sends an important message to workers that, “We do things the right way in this company.” Conversely, slacking off of maintenance sends a message that it’s okay to cut corners in other parts of the business. Knowing when to replace a truck relies heavily on forklift types and their lifespan. Even when properly maintained, forklifts will become older and less efficient over time. This can impact fuel costs, productivity and result in more downtime. All of which increase operational costs and affect your bottom line. Knowing what to expect can help make the right decision for your business. As forklifts begin to wear down, many companies continue to repair rather than replace them. Forklifts are a big capital expense, and even major repairs cost less than buying a new truck. So they continue using the aging forklift until it is no longer serviceable. In reality, this approach can cost more than replacing an aging truck. That’s why industry experts say the decision to replace should be based on the economic value of the truck rather than its age. Once the cost of maintaining a forklift exceeds the cost of buying a new one, it’s time to replace it. This requires tracking all the costs involved: fuel, labor, maintenance, repairs, replacement parts, downtime, and more. The best approach is to have a planned replacement strategy. This involves tracking all costs related to forklift use throughout its lifetime. Then determine an “optimum replacement threshold” based on economic value, not the physical condition of the truck. Whether your forklifts are old, new or in between – the safety of your workers always comes first. Proper forklift maintenance is a key safety factor, but safety starts with training and certification. You can have the best maintained fleet of trucks in the U.S. But if operators don’t know how to use the trucks properly, their safety will be compromised. CertifyMe.net offers fast, affordable online training for all types of forklifts. Our training is OSHA-approved. And you can take it anywhere you have Internet access. Visit us online, or call us at 888-699-4800 today. This entry was posted in Uncategorized and tagged Forklift, Forklift Blog, Forklift Maintenance on March 29, 2019 by admin.